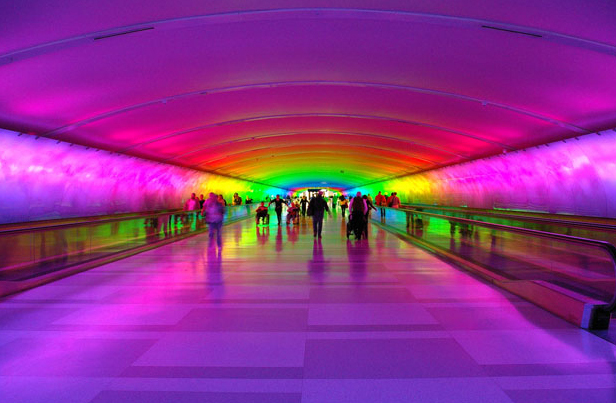 Detroit Airport Tunnel by the Smith Group. It’s a choice to set out on the road. Sometimes it’s for business, sometimes for adventure, but always interesting. I’ve had the good fortune to travel to many fascinating places. When I was young my family lived in Latin America: Mexico, Nicaragua, Colombia, Uruguay and Paraguay. I spent a lot of time in airports waiting hours and hours for connections. Most of the time I read or paced the hallways, watching fellow travelers. But now, the functional part of travel.. airports at least… are more interesting. 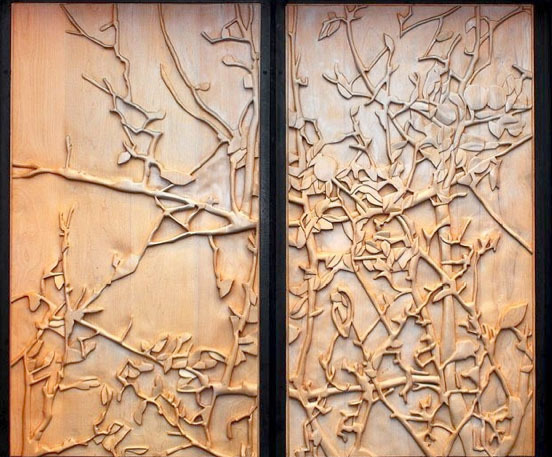 Thanks to 1% for the Arts public buildings are required to include works of art that are substantial and innovative. One of my favorites is the fountain in the Detroit Airport. The black marble base creates a powerfully reflective surface. Arcing above still water is are lines of light caught in a jet of water. The hypnotic sequencing of the water jets is truly amazing. Water and light become intermittent lines in a hypnotic, syncopated rhythm. The Burlington Vermont airport has a wonderful installation by Andrea Wasserman and Elizabeth Billings. 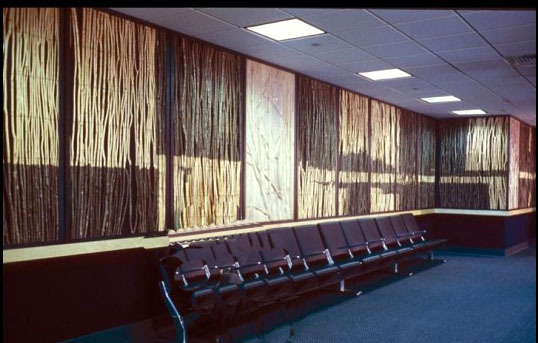 Burlington Vermont Airport installation by Andrea Wasserman and Elizabeth Billings. It is quintessentially Vermont, expressing the abundance and elegance of the natural forests of the Green Mountains. I never tire of looking at it. Viewed as a whole it is stunning, but the elegant interpretation and craftsmanship bear a close look as well. Detail of Andrea Wasserman and Elizabeth Billings' installation in the Burlington Vermont airport.